In the ongoing trial of the NIA 9, Hon Fatoumata K Jawara continues giving her testimony as defence council questions her at the Banjul High Courts. The trial is in connection to the arrest and alleged tortures she and her colleagues had in the hands of the NIA operatives. The defence lawyer in the ongoing NIA 9 trial, Saikou Fatty told prosecution witness Fatoumata Jawara who claimed she was tortured alongside the late Solo Sandeng and others at the NIA, that she was beaten by jugglers and not NIA officials. In response, Madam Jawara said all she can confirm is that she was escorted by NIA officers at night and was beaten by them. Lawyer Fatty also asked Hon. Jawara whether she knew that the NIA is a government institution and not an entity to which Madam Jawara replied by saying that the NIA is a place where human rights are violated. The lead defence lawyer Christopher E Mene asked Hon. Jawara if she ever heard about a group of people referred to as jugglers to which the witness replied that such a name has come up in her discussion with Nogoi Njie during their detention at the NIA. But Mene maintained that Nogoi Njie had once commented to the witness that the NIA are useless otherwise the jugglers would not have come to the NIA to beat people. But Hon. 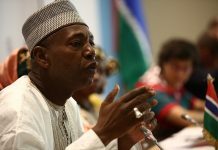 Jawara insisted that she could not recall any such conversation between her and Nogoi Njie. However Mene still insisted that that conversation with Nogoi did take place and Nogoi had told her (Jawara) that the jugglers and the NIA are birds of the same feather. Testifying further Hon. Jawara said she could remember giving a statement to the police in connection with the case but cannot recall the date or signing it. Defence lawyer Mene put to her that she had signed the said statement in the presence of 3576 Fatoumata A Bah in June 2017, and that the said statement is the only one she made to the police, noting that the only reason Hon. Jawara denied her own statement is that her conversation with Nogoi Njie was recorded there. The trial continues.